Alpha Gamma Rho - Omega - Articles - Beta Nu News- FARMERS FIGHT! Articles > Beta Nu News- FARMERS FIGHT! Beta Nu News- FARMERS FIGHT! As I attempt to start this latest report of the chapter's events and affairs, all I can say is WOW. It's been too long since I last posted an update (sorry, y'all), but we've been so busy with all the dynamic events we've been planning, preparing, and hosting that finding the time to write one of these doesn't happen too often. That's 8 Beta Nu AGvocates, 2 Sigma Alpha AGvocates, and Mr. Larry Graham of Southwest Dairy Farmers, who brought the Mobile Dairy Classroom to campus. Each of the four milking demonstrations he performed drew an interested crowd of students who were excited to learn more about just how their milk gets from cow to cup. The first annual Farmers Fight! day was an immense success and achieved higher goals than we could've imagined. 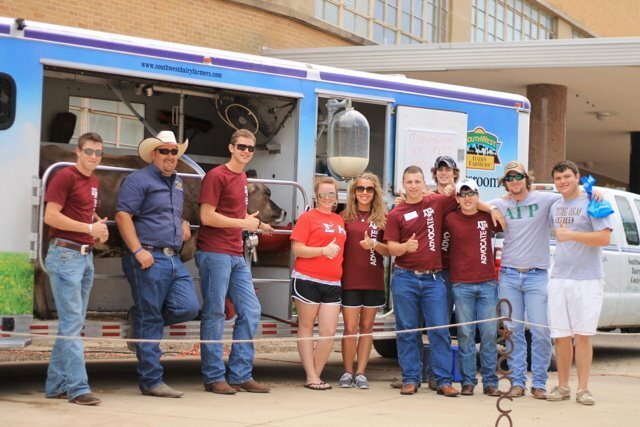 The entire campus buzzed with the presence of the Farmers Fight advocate teams and their educational booths, and the movement received considerable publicity from various media sources throughout College Station and beyond. A few ag industry representatives were even on hand to see just what we were doing for the advancement of agricultural education and awareness. We spread our message to thousands of students, well achieving our goal of spreading Agricultural awareness and debunking harmful myths currently facing the ag industry. That's a full post, I'd say. Y'all be watching for more Beta Nu news, coming soon!